If you’re planning to spend Valentine’s night IN like me and my hubby are, it doesn’t make sense to ogle over fancy dresses or 2 inch heels. Me? I’ll be kicking it in some casual clothes all day and night this Valentine’s, but I admit I do like to dress a little for the occasion! 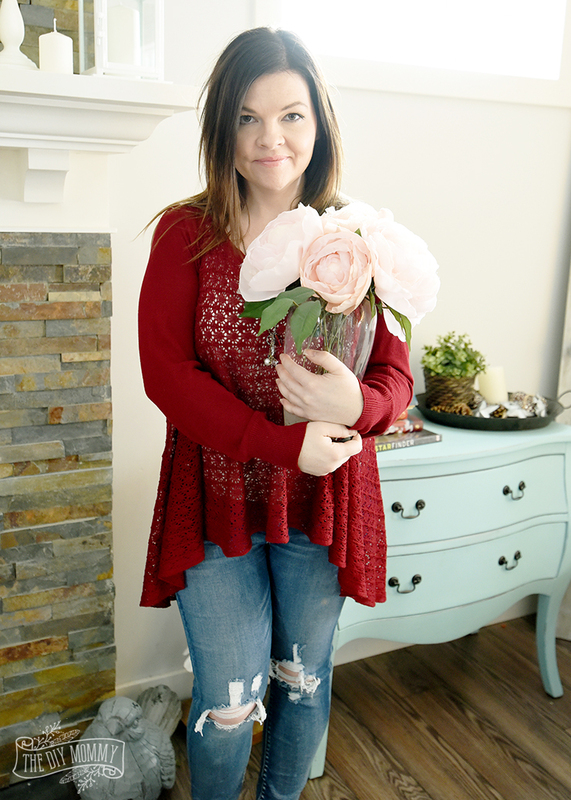 Here are a couple of casual, comfy Valentine outfit ideas for the petite curvy mama like me. First, I don’t think you can EVER go wrong with a floral top at any time of the year. However, I think they’re especially perfect on Valentine’s Day! Nothing says romance like flowers, and this one is one of my favourites of all time. 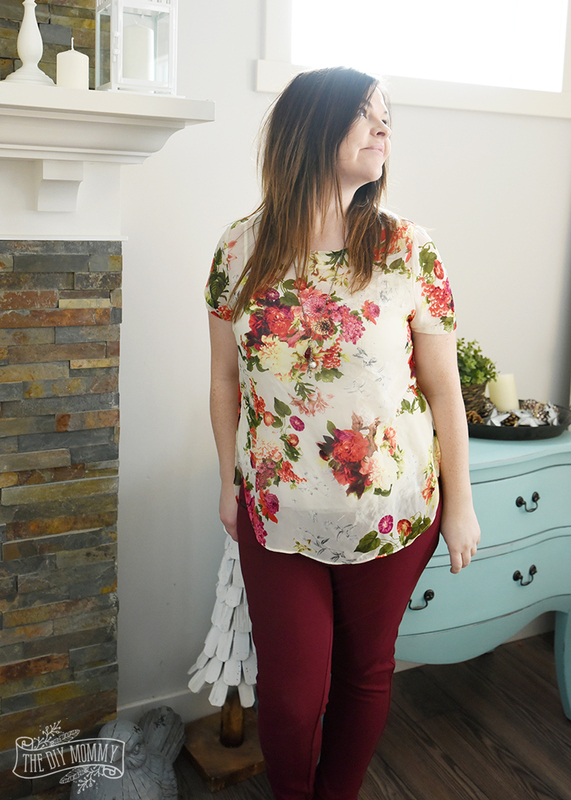 I found this top on clearance at ModCloth and these burgundy skinnies at Joe Fresh a couple of years ago, but you can find similar ones in the style widget at the end of this post. … it can turn into a swingy sweater with a little flip of fabric! 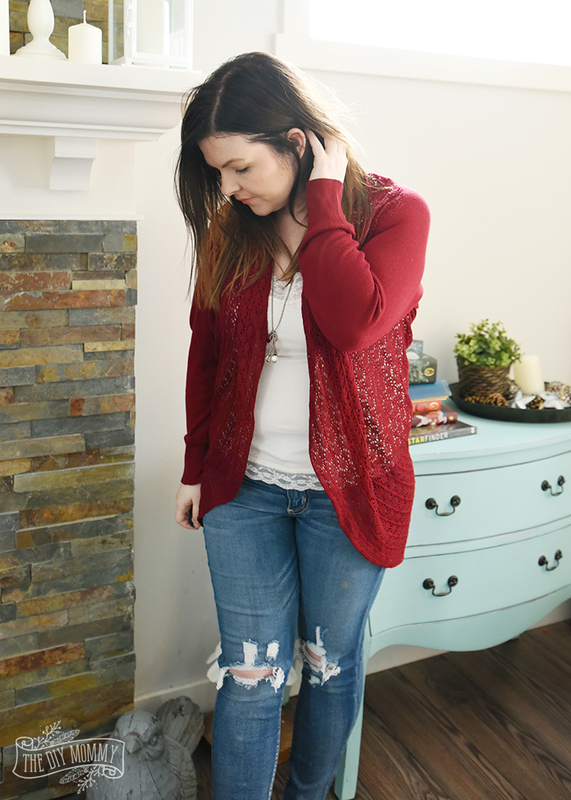 These jeggings are a part of my favourite jean line of all time – the high-rise jeggings from American Eagle Outfitters (I have 4 different pairs) – and I love the holey knees for a fun, casual mama-on-the-go look. They are by far my favourite line of jeggings for fitting a curvy figure! Disclosure: This post contains affiliate links, which means that if you click on one of the product links, I’ll receive a small commission from the sale at no cost to you. Hello Christina, this outfit is looking adorable. I must say this combination is perfect for the valentine day. These are so pretty ideas for share. Thank you so much for sharing. I am randomly searching for dress idea to wear on the first date. I like that red one it’s looks simple and perfect for me. Thanks for this post.